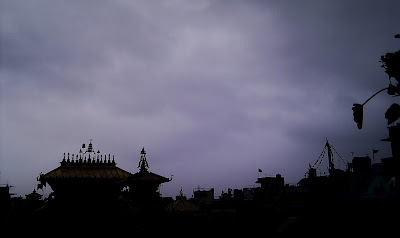 Kathmandu, February 8: Kathmandu woke up Wednesday morning with cold morning welcomed with rain and thunder that continued from previous night around 11pm. By the noon time, mercury measure in Kathmandu was more than 10° lower compared to the previous day same time. Total precipitation accumulated in Patan by noon time was 17mm. It is not uncommon to receive rain towards the end of the winter for the year. The cloud spreading through out the nation may bring more rain or at least continue till tomorrow morning in Kathmandu. Still not time to close your winter clothes in your closets. Below comparison of hourly temperature Feb 7 and Feb 8. Update: The official record by the meteorological forecast department of Nepal reported 32mm of rain collect in past 24 hours (24 hours from 5:45pm). Similarly, the maximum and minimum temperature converged at around 10 degrees with a difference of mere two degrees. If the current weather trend and factors remain unchanged there is possibility of another shot of rain in Kathmandu exactly one week from today. Click here for more on weather.